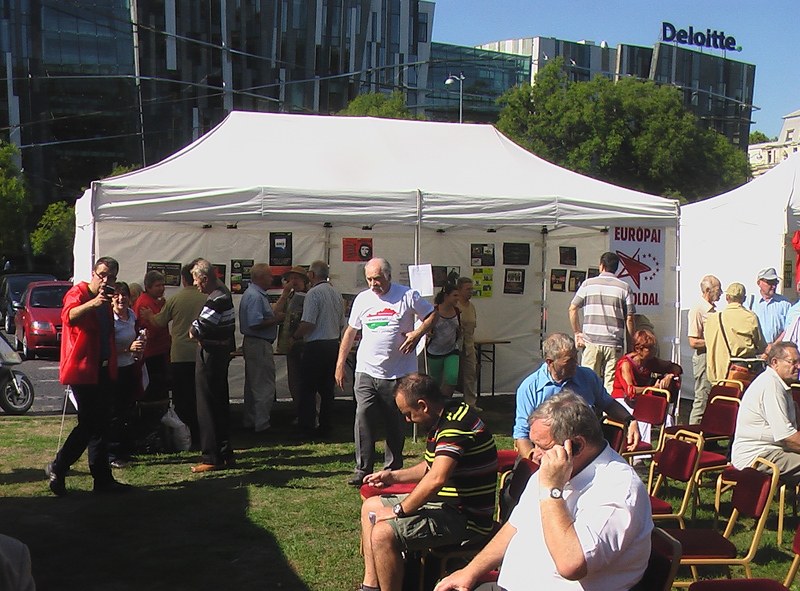 The Festival was organised by Transform Network, financed by the European Left Party. Main organisations/Parties (Leading figures in the debates): Hungarian Socialist Party (Tibor Szanyi, Gyula Hegyi), Hungarian Workers Party 2006 (Attila Vajnai, Ferenc Havranek, Peter Buzasi, Tamas Morva), Dialogue for Hungary (Gabor Scheiring), Green Left Party (Krisztina Noé, György Droppa), Fourth Republic- 4K! (Andras Istvanffy),Transform Hungary (Peter Szekely), Le Monde Diplo (Judit Morva), Unconditional Basic Income (Farkas Hatlabu), Hungarian Antifascist Organisations ( Krisztina Noe, Tibor Ballo, Tamas Hirschler, Zina Mihajlova), Feminists (Erika Banki, Reka Szatmari, Peter Konok), Latin-American Society ( Laszlo Kupi, Ivan Harsanyi), Civil Movement (Kata Toth), Hungarian United Left Movement (Gyula Meszaros, Gabor Szasz), Karl Marx Society (Peter Farkas, Csaba Balta), HSF Foundation (Vera Zalka). 1.) Future of the European Union – How to transform the EU into a social one? Panelists: Peter Szigeti, Gyula Hegyi, Gabor Scheiring, Ferenc Istvanffy, Judith Morva (facilitator). They agreed that the EU should expand significantly its social budget to tackle unemployment and to ease social problems. This can take away the edge of nationalist propaganda in Hungary. Peter Szigeti stressed that we can create a more social Hungary in a more social Europe, as the world is heading towards large integrations.It is not possible to return to the welfare state in the nation-state framework at European Union level. There is a need for competition of bourgeois democracy and democratic socialism – he added. Andras Istvánffy said that Orban’s freedom fighters rhetoric is “fake”, but Orban is playing with the people’s disillusionment about the European Union. Liberal position on the unritical support of the EU does not mean its antidote – he added. According to Gabor Schering the only way out of the economic crisis is an international cooperation, and creating meaningful social and environmental programs and doing so the air will run out of „FIDESZ’ narrow-minded nationalist policies”. Attila Vajnai, the leader in Hungarian Workers Party 2006 said to the Hungarian News Agency (MTI) that the slogan for the European Left was to make Europe become more social. It is important that the European Left should appear in Hungary, because the crisis phenomena experienced in Hungary, the decreasing value of pensions, the problem of foreign currency loans, the increasing child famine are not specific (only) to Hungary. The social crisis appeared almost in all of Europe. For this reason the aim of the European Left is to find solutions applicable to the continent as a whole. Consequently, a significant part of the European funds is to be paid to prevent massive crowds from slipping into poverty – said Attila Vajnai. d.) Peter Farkas: From the tax havens till the green movements (Critical encyclopedia about world economy and globalization). Taking into consideration that this type of Pan-Leftist Festival was the first one organized after the systemic change I do think that this event was a success. It has proved to the participants and also to the wider Hungarian public that building a broad alliance of progressive democratic forces, the right-wing Orban goverment can be replaced maybe in 2014, but surely in 2018.